Sorrento Review is a complete guide to the beautiful Sorrento Peninsula in southern Italy. Part of the Italy Review Network, Sorrento Review provides a wealth of helpful visitor information including advice on travel, hotel booking, car rental and excursions. We also provide transfers to and from Naples as well as lots of useful hints and tips on things to see and do in the region. HERE'S SOME OF WHAT YOU CAN FIND ON SORRENTO REVIEW! 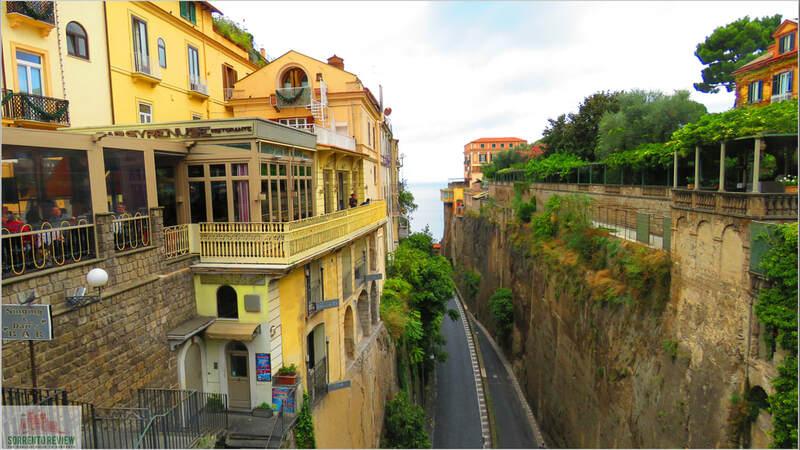 The "Best of Sorrento Blog" is written by site contributor and Sorrento expert Eddie Best. In this column, Eddie shares his knowledge of Sorrento with not only great cultural insight but also lots of handy tips and advice for travellers. “You may have the universe if I may have Italy,” said the great opera composer, Giuseppe Verdi, well, his librettist said it but his love of Italy is there for all to see. - to see and be seen. The Piazza Tasso, in the centre of town, was built in 1866 and the statue of the patron saint of Sorrento, Sant’Antonino Abate or Saint Anthony the Abbot stands proudly in the middle. There are three statues of him in Sorrento and another one is in Piazza Sant’Antonino. It’s beside the town hall and the 11th century Basilica di Sant’Antonino, also named after him, is nearby. To see my photos of Sorrento please click here to see my photo album on Flickr. In the Photo Blog I'll be keeping you up to date with the latest goings on in Sorrento as well as bringing to life some of the town's most interesting places. Among Sorrento's key features are its three marinas. Marina Piccola is used for boat trips to places like the islands of Ischia or Capri while Marina San Francesco is used as an area for Beach Clubs. In today's photo I've chosen Marina Grande which has its own sandy beach and lots of great fish restaurants. To get the best of the sunshine it's best to come here in the morning and you're then well-placed for a sumptuous lunch followed by a stroll into the town's excellent shopping area. To help you navigate your way around and familiarise yourself with Sorrento we've put the top sights in here, neatly categorized under headings such as Marinas, Churches, Squares, Streets and Piazzas. We've added some useful travel features to the site including bus timetables and a ferry ticket booking engine for popular nearby destinations such as Ischia, Capri, Naples and the Amalfi Coast. There's a wide range of Sorrento Hotels to choose from and to help you with that you can use our Booking.com search engine to find the best accommodation with low prices and free cancellation. If you're looking for a stress-free transfer from Naples Airport we can offer a highly reliable service with English-speaking staff. Please e-mail info@italyreview.com for prices and further details.